In just 12 short months your baby will undergo an incredible transformation from a helpless newborn to an active toddler. Babies may grow and change at a very surprising pace, and for baby’s first year they bring new and amazing developments. Some babies would utter their first word at eight months, while others won’t talk until after baby’s first year. And some would start walking anytime between nine and 18 months. With those baby developments kept in mind, here is what your baby may be doing during his early stage of the first year. Smile at you. 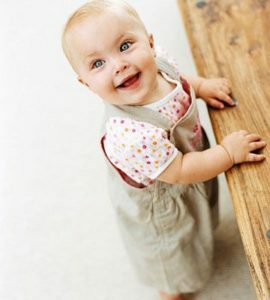 Within the first three months your baby will be smiling in response to your smiles while trying to get your attention. Hold objects with his hands. Has the ability to raise his head and chest when lying on his stomach. Track objects with his eyes. Try to reach for dangling objects even though he won’t be able to get them yet. Moving and exploring his own hands, like trying to put his hands into his mouth. Learn to roll over from front to back and from back to front. Ability to grab and manipulate objects using her own hands. May start teething stage. This may also require a teether for assisting in the eruption of teeth. Learn how to sit all by himself. Respond to familiar words like his name, and may start babbling “Dada” and “Mama”. Remember his favorite toys or objects. Get your attention by pointing at the objects he wants. Utter one or two words like “Mama” and “Dada”. Know how to feed himself. Learn how to stand by himself. Take his first steps at around one year old, but this may vary greatly between babies.